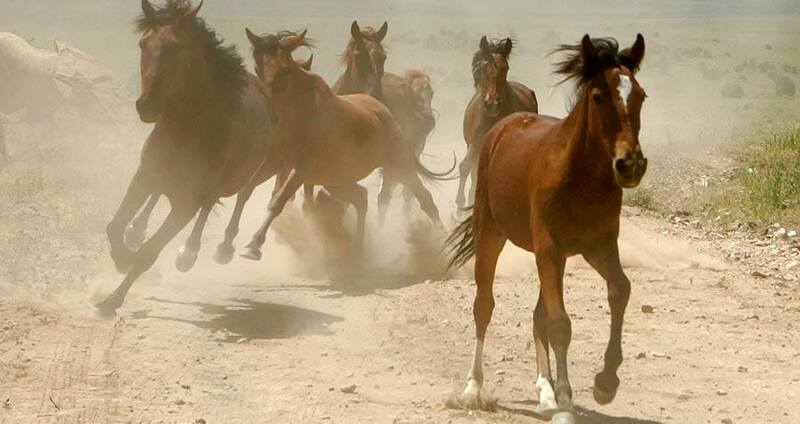 On Friday, the Bureau of Land Management’s (BLM) National Wild Horse and Burro Advisory Board voted in favor of killing 45,000 wild horses currently in government holding. This decision has been a long time in the making. As Inhabitat reported, over the course of two decades the BLM has removed wild horses from their natural habitat so that privately owned cattle can graze on the land. The horses obviously had to go somewhere, and so the BLM placed them in government-owned facilities across the United States. These facilities have generated problems of their own: Just in 2015, they cost taxpayers $49 million, nearly half of the horse and burro program’s budget. In response to these costs, the view that wild horse populations are too high and will overgraze rangelands, the BLM advisory board voted to recommend that the horses be euthanized — a move which has generated harsh criticisms from animal rights activists. For instance, BLM critics say that the wild horse “overpopulation problem” is a result of the BLM’s policy of rounding up and warehousing the horses, not a sign that the policy needs to add euthanasia to its management regimen. In recent years, some have gone further than Kahrens in assailing the BLM’s horse roundup policy, saying that its concerns with horse overpopulation are based more in fiction than fact. Still, some who work in the American livestock industry say that if the horses are not contained, they may face financial ruin. “I’m on the range and I see what the damage is,” Utah rancher Fred Tolbert told NBC News. Tolbert pays the BLM for permits to graze his cattle with wild horses, and says he’s had enough of the horses’ overgrazing. Indeed, Laura Leigh of the Wild Horse Education advocacy group has taken BLM to court four times for what she views as inhumane treatment of the animals. Leigh is referring to how the BLM rounds up horses: helicopters hover over horses and drive wild horses into a trap, from which point horse families are split up and sent to separate holding facilities. But critics say there are better ways to solve the population problem. Next, learn how people get overpopulation wrong with people, too.